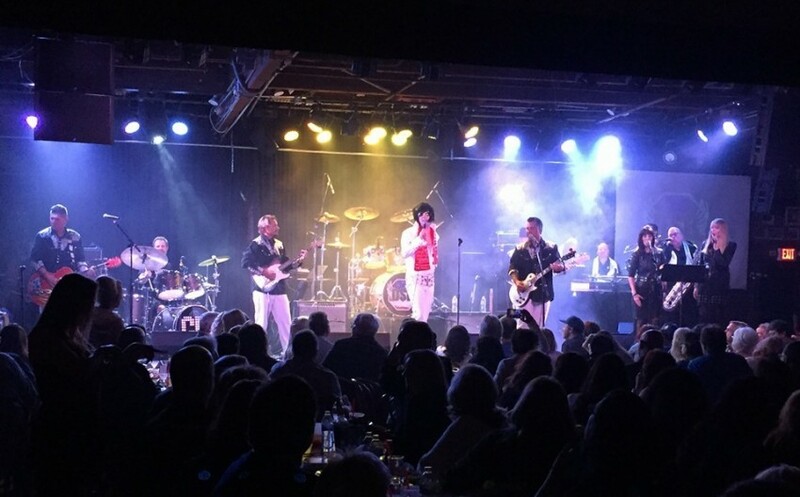 GRACEBAND: The 12 Piece Tribute to "The King"
Graceband is an explosion of fun, high-energy, rock n roll. Channeling the best of “The King's” Vegas years, you'll hear the big hits with big arrangements, from California's only 12 piece Elvis Tribute. 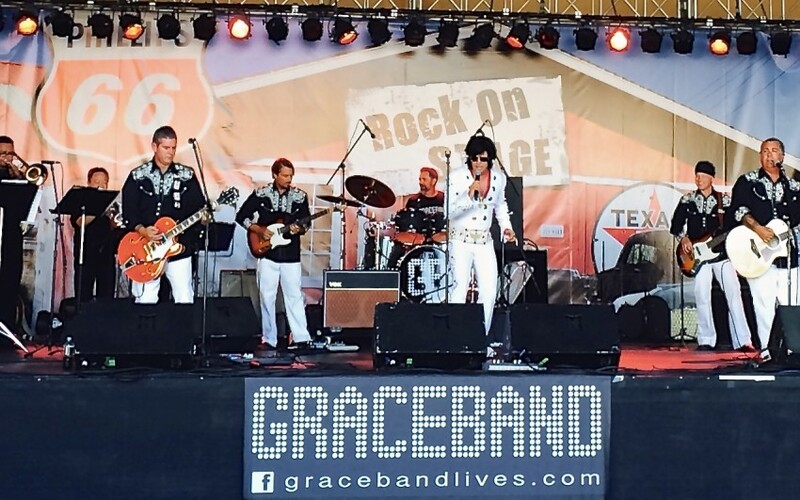 You wont find a more accomplished or fun tribute than Graceband, having recently been featured in major print, radio and TV profiles, and a staple at top clubs, fairs and events throughout the state. Every show opens with Elvis' theatrical entrance to the 2001 space odyssey theme, followed by a dance inducing lineup that includes All Shook Up, Burning Love, Suspicious Minds, while mixing in a little Led Zeppelin, Black Crowes and others. No one forgets a night with The King! 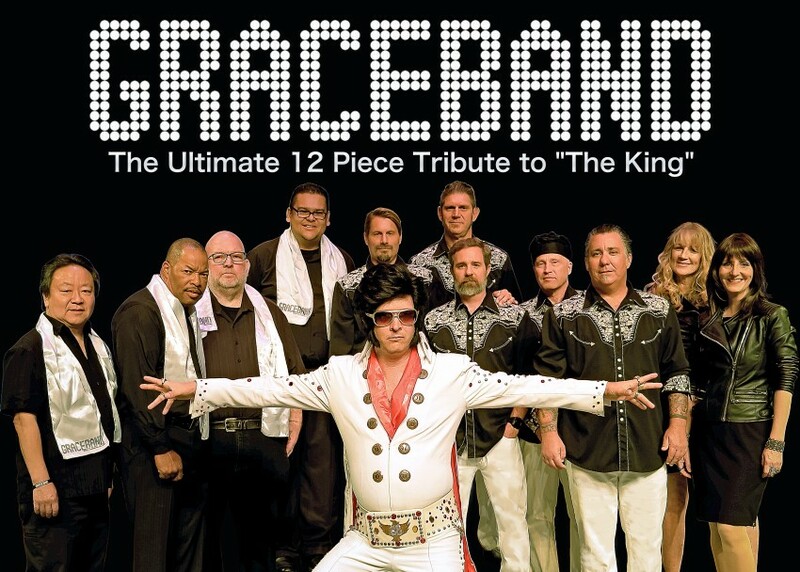 Be the first to review GRACEBAND: The 12 Piece Tribute to "The King"
Graceband is a professional and accomplished 12 piece Elvis tribute. We have worked over 100 shows a year for corporate events, casinos, private parties, and clubs. We are passionate about what we do, and what we do is ensure your event is a great time for your guests. We play a fun and very dance centric playlist. Featuring all of Elvis' hits, but also pivoting into Led Zeppelin, AC/DC, Stray Cats, and others as is appropriate for the event. There are many opportunities to work in prominent leaders or people throughout the show, and a myriad of picture taking possibilities. As a band, no one sounds better or gets you off your feet like Graceband. The power of a live horn section, combined with a full band and backing singers is a force to behold. The entertainment value that Chris brings as Elvis is truly unique as well, keeping the crowd laughing and dancing all night long. We like to talk before the event to ensure we are aligned on what the planner wants, and then roll out our set list and plan for their approval. In our 10 years of performing we have many repeat customers, and are regularly at the main clubs up & down the CA coast. Let us know how we can make your event both fun, special, and exceedingly memorable! Every show opens with Elvis' theatrical entrance to the 2001 space odyssey theme, followed by a dance inducing lineup that includes All Shook Up, Burning Love, Suspicious Minds, and many others. And just when you think you know whats coming next, we mix it up with a little AC/DC, Zeppelin, Stray Cats and more, all of which are Elvis-ed out with our big band. We can have a lot of fun with key guests or celebrations, and of course there are a myriad of picture opportunities before & after the show. Graceband is the most authentic sounding tribute you will find, complete with a full horn section, backing singers and a world class stage show of lights, lasers, karate, and for a few lucky ladies, a silk scarf. We specialize in fun crowd interaction, a high level of entertainment, and as we say, “a celebration, not just an impersonation”. Let us know if we can help make your event a trending topic with your friends and colleagues. No one forgets the night they spend with The King! Stageplot to be provided upon request. Will need clarity from event planner if we are in a staged setting with audio, or we are expected to provide staging and audio. We are comfortable with either approach. We have the ability to provide professional HD video of each show, edited from multiple sources into a single video. Please inquire if interested. Recent review: Natural talent....audience enjoyed his performance!